For almost 25 years now, Solar Gem Greenhouses has been chatting with first time greenhouse owners about exactly how to choose a greenhouse and exactly which of our top-quality backyard greenhouses will best suit their gardening needs. The process often involves helping each of them to make a sound decision concerning the size and placement of their backyard garden. What makes a good greenhouse selection for one, may not work so well for another. So, here’s a brief guide, distilled from the thousands of conversations we’ve had with our very happy backyard gardening enthusiasts over the decades. It may seem obvious, but this must be everyone’s first consideration when sorting through how to choose a greenhouse that’s best for your circumstances. How big is my backyard, and how much room do I want to dedicate exclusively for gardening? This can be further complicated by oddly shaped backyards, or backyards that are already teeming with other structures or natural obstructions (read: trees). Take a look at the dimensions of the four greenhouse sizes we offer and, using a tape measure, see what sizes will fit. Some Solar Gem Greenhouse owners have to grapple with a backyard surrounded with very tall trees and/or dense brush that can block out vegetable and plant-loving sunshine for parts of the year. If you have lots of trees or heavy brush that casts shade over large swaths of your backyard, try to find a place that offers balance…some direct sunshine, along with the inevitable shade. Ideally, think about a place that gets the most sun in the winter months, and your plants will love you for it. Be confident that a Solar Gem Greenhouses‘ unique materials and build quality will make the most of whatever particular sunlight conditions you have, and that only the most sunlight-deprived backyards will need to consider any grow-light supplementation. For those who don’t have a too-much-shade challenge, the process of choosing a greenhouse is less complicated. So, it’s on to the next step. 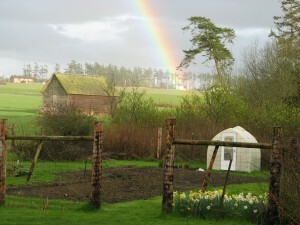 Even if you don’t plan on gardening directly into the ground in your Solar Gem Greenhouse to grow, say, onions, carrots, cabbage or the like, you still want to avoid placing your greenhouse over adverse soil, like areas where the water table is very high. If the soil you are thinking about placing your Solar Gem over is constantly saturated with water, and “squishes” when you walk over it, you are going to want to rethink your placement. This swampy soil will never accommodate any in-ground growing, but importantly, it will offer far too much humidity inside your greenhouse than is ideal. Lastly, an area on a steep slope that meets all the other criteria is a bad spot. If you can’t find an area that’s close to level, or can be readily made level, then you might have to pick a spot that you will make level (building a small retaining wall, bringing in some extra soil, etc.) so that you aren’t gardening on an awkward slope! This consideration is important to factor in because it has everything to do with the size of the Solar Gem Greenhouse you will want to purchase. If you have a very small urban backyard, and only intend to grow a few tomato plants during the year, then a Lil’Debi (8’x 4’7″) or a Small (8’x7.5′) may be all you’ll ever need. However, if you are more ambitious and want to grow a variety of yummy, healthful fresh vegetables, herbs, spices, and perhaps some fruit, then you’ll want to think about a Medium (8’x12′) or a Large (8’x15′). This thinking also applies to those who want to aggressively cut into their grocery bills. The more space you have to grow, the more you can grow, and the less you’ll need to buy at the grocery store. BUT BEWARE…we’ve never had a Solar Gem Greenhouse owner tell us that they regretted buying a size larger than they thought they would need, but we have had many who have regretted buying a size smaller than they thought they would need. Choose a greenhouse that projects forward and can grow with you. Seems that a new Solar Gem Greenhouse can really motivate the average gardener into growing lots of things they never imagined they would! No matter which Solar Gem Greenhouse you decide is right for you, know that you have the finest year-round backyard greenhouse available anywhere. Grow whatever your hearts desire, eat healthier, go organic, cut your grocery bill, and enjoy every wonderful minute of it. And remember, setting up a greenhouse in your backyard is a snap if it’s a Solar Gem…no assembly required, no special foundation needed, and no ongoing maintenance. THIS is how smart, highly successful backyard gardeners do it. We hope that this brief foray into how to best choose your backyard greenhouse has been helpful and enlightening. If you have any questions, please call or send us an e-mail…we’re here to help you be the best gardener you can be. The factory staff, and our wonderful independent dealers across the U.S. and Canada, are ready to help you get the most from your Solar Gem Greenhouse. Happy gardening.